Most teachers aren’t the most technically inclined people, but as the generations turn and the teachers of old are replaced by the teachers of new, the popularity of educating via the internet continues to soar. You see this everywhere via online university courses, online programs, online certificates, etc. It has never been easier to share information with anyone, anywhere in the world, thanks to the internet. So how do you wield this power to make a brilliant education blog? Foundation consists of choosing your niche, setting up your domain and web hosting, then picking a theme that you will use for your blog. Without a strong foundation, whatever tall, glorified building you’re trying to create per se, will crumble. I’m sure you’ve probably heard of this dreaded word before. If you haven’t, then the best definition to think of to go along with this word is the second noun definition found on dictionary.com “a place or position suitable or appropriate for a person or thing.” In the world of online education the only thing that is suitable for creating a brilliant blog is your passion. In this case, what do you teach? Are you a science teacher? Do you teach math? Do you teach english? Or are you a university professor that specializes in a specific major? A mix of majors? Do you teach theory? Or do you teach practice? Are you an elementary-school teacher so your audience is more parents? Or do you teach high school students? These are some questions you have to figure out to make your blog brilliant. You can’t teach what you don’t know right? You will not be able to do some of the other steps in this how to guide if you do not pick the correct niche from the very beginning. If you’re not choosing something you’re passionate about, it will be recognizable and your motivation to continue to deliver the best to your audience will falter over time. Here is a list of the best WordPress web hosts to choose from and a brief summary of each one; however, I would recommend BlueHost. However, you can opt for other hosts as well from this list. Most important thing to know about DreamHost is you get 1-click installation of WordPress to your site, a free domain name at purchase, unlimited email accounts and unlimited 24/7 support. The domain is the middle part of your www. --- . com. For example, the domain name of Google is google: www.google.com. This is important as it’s your identity, it’s your virtual home or business address. It should be relevant to your niche and keyword. I can go deeper into details on how to do keyword research but that may slow you down from taking the most important step: the first one. So choose a domain name that is relevant to what you’re teaching, or you can choose your name. This is very common for people who are creating a website for the first time. Themes are important because they are the interior design of your virtual house or business. Do you want it to feel cozy? Do you want it to feel fun and bright? Do you want it to feel more streamline, or minimalist? These are some questions that will help you find the core emotion to how you want people to feel when they come to your site, and with that in mind you can find a theme that evokes that emotion and go with it. Unlike real house-buying, for your virtual house, the interior design (theme) may be the most costly part, rather than the house itself (the domain & web hosting). A great theme takes a lot of work for web designers and web development teams, as well as their ongoing updates and support for those themes to keep them up to date and to meet customer demands so choose wisely and go with the one that you see yourself sticking with for the long haul. Utilize the demos and scour every inch of them. Read the reviews before you make a final decision. Think about the times. We have an ADD type of society now. Everyone wants things quick and fast, and if they don’t get what they’re looking for fast enough, they discard it quickly. Therefore, you should always have high quality content that engages and gives your reader more to think about, or is a one stop shop for them in regards to finding the information they are seeking out. There are an infinite number of possibilities that you can come up with when thinking of what to make a post about, depending on the depth of your niche. No matter what you should always be consistent and reliable with whatever you’re posting. Reliable, whereas what you’re posting will be of high quality and provide the reader with some type of value. Consistent, whereas readers can come back and know that you’ll have some new information for them. I suggest once a week or once every two weeks so that you don’t get burnt out. It depends on your schedule of course and what works best for you. Lastly, you should always link to additional resources, tools, cool websites in the niche you’ve selected and enjoy. This establishes yourself as a student of the subject and not as some self-proclaimed know it all. People like other people who they can relate with, and by positioning yourself as a student of the subject, you’ll help yourself build more trust with your audience. Be cautious on utilizing affiliate links and promotions. You can easily stop yourself from acquiring a great following by promoting for a profit. The Internet isn’t far off from the greatest libraries in the world but it is so much better because you don’t have to wait for books to come, or read through so many of them to find what you’re looking for; however, you still must be very careful when trusting something you read from the internet. That’s why it is very important to utilize sources when you write, a common mistake that a lot of content creators forget to do. Some other common mistakes are of course spelling and hiccups in grammar. In any blog that is professional or formal, these small things can sometimes be big subtractors to your overall mission as they undermine your professionalism and rob your credibility. You can avoid them by re-reading,editing and revising your work before submitting it. Reading out loud is very helpful so that you can listen for anything that doesn’t sound correct when read. Lastly, internet plagiarism is very big. Content theft runs rampant throughout the internet, especially because there are so many users who do not properly source their articles and want to get attributed for the creation of the brilliance themselves. For this reason alone it is very important to utilize any plagiarism checker at all times. It’ll help you get answers to your question on the spot, rather than having to wait days or weeks for email support at other plagiarism checkers. You can find a good one here. Unique content comes when the creator (you) are having fun obviously! When you’re having fun and enjoying what you’re writing about, the creativity flows easily. This is another reason why it’s important to choose a topic that you’re passionate about. If you’re an educator, it isn’t hard for you to get in front of a classroom or audience, so it shouldn’t be hard for you to make some video recordings of yourself. This is 100% guaranteed to be unique as I’m sure you’re a dynamic teacher who can deliver your subjects and topics with great enthusiasm. You can also do webinar campaigns, offer online tutoring sessions and post the recordings on your site afterwards if the student gives you his/her consent. Another way to create some very unique content is to do your research. During your research you want to find the void, or the cracks in other people’s research or articles that could utilize a lot more detail. Be the plug that fills the void and you’ll definitely attract more readers attention. Source properly all the time and make connections with those other internet authorities in your subject to help elevate both of your individual missions. 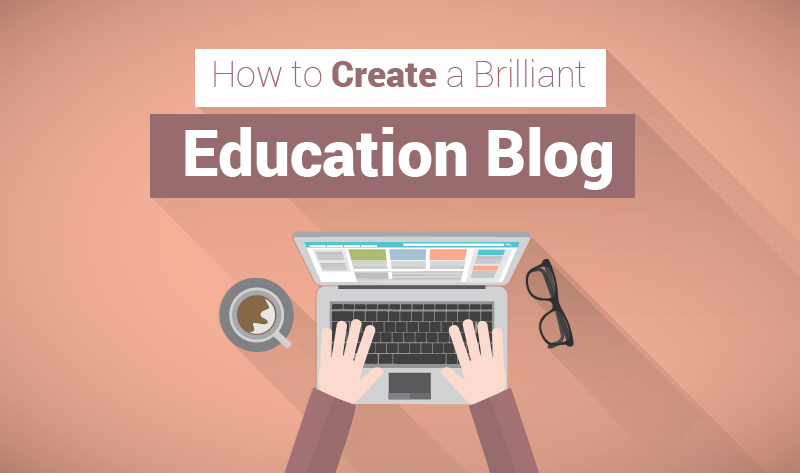 Your professionalism, passion, dedication, and genuine love for what you do will be what makes your education blog brilliant. Following the steps listed up above will get you into the game, but you have to continue to play it at a high level to go far. It starts and ends with you.